As one would expect, this isn’t the typical fluff. David goes super deep and covered 40 vendors in a 140 page report. This will become the go to guide for those shopping the category. The cost is $495 but the value is far more than that. David’s allowed us to share a downloadable overview of the report, grab one for yourself! [Mark Ogne] Let’s start with the beginning… how do you position your buying guide, who is the buyer, what is the value you deliver within it? [David Raab] The buyer is a someone trying to figure out what products belong in their ABM stack. Most likely a martech specialist, but possibly a marketer or IT person. The core value is explaining what the different vendors do, both at the high level (types of functions they provide) and in detail (how they differ from direct competitors or seemingly similar products). That’s information which is really hard to gather on your own, even if you knew which vendors were out there. [Mark Ogne] Were there any surprises? [David Raab] The number of vendors was surprising when I first got started. At the end, it was surprising how different even similar vendors were. For example, even though all predictive vendors will create scoring models, they differ in what’s done by the vendor vs. self-service, the preparation needed to build models, the types of data they use, the access that users have to results, and so on. Those are significant differences, not just subtle nuances that don’t really matter. Same in other vendor groups. [Mark Ogne] What was the biggest learning point for you personally during this process? 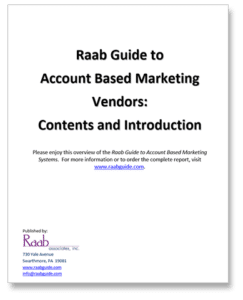 [David Raab] It forced me to look more closely at the different functions that go into various parts of the ABM process, to see just how many moving parts there are to a complete solution. Even something as simple as creating personalized messages turns out to have many dimensions such as selecting messages based on account, buying stage, persona, campaign stage, channel, behaviors, intent, and previous consumption. No one system captures all those, so you need several to do the best job possible. [Mark Ogne] Not to give away the secrets of the report, but what was the most interesting thing that B2B marketers will find in the report? [David Raab] I think it will be that they can very likely find a vendor who has addressed their specific problems, even if those problems seem unique. Looking for a particular market segment? To integrate third party content? To tailor messages by persona? To add social media handles to your database? To match leads with accounts? There are systems to do all that – but you have to know which ones. David Raab is an amazing ‘MarTech Guru’. If anyone ever deserved that title on a business card, it’s him!